Recently we have been moving services to the Cloud (AKA other people's computers.) Amazon Web Services (AWS) offers two different types of cloud service: Gov cloud and Commercial cloud. Gov cloud is marketed to federal, state, and local government entities and offers hosting within the Untied States. The biggest issue I have found with Gov cloud is that only a fraction of the functionality offered in Commercial AWS is offered in Gov cloud. Gov cloud is pretty much a stripped down version of the Commercial AWS. The cloud in my opinion serves a purpose, first and foremost to host stand-alone public facing applications. This is not a place to host heavy web applications that depend on data or content you are not wiling to host in the cloud. But there is still a need to connect to your corporate network for monitoring, auditing, or publishing content. That being said, we have recently built out AWS infrastructure and wanted to share the design we came up with. Our first hurdle is the amount Amazon charges for VPN connectivity to a VPC. 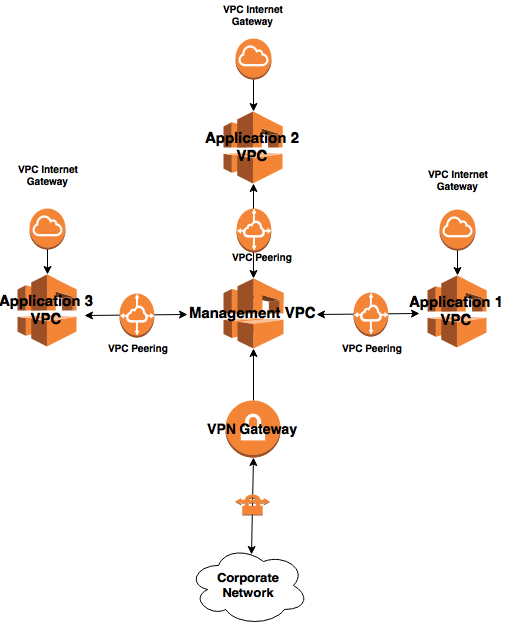 And if you want connectivity to a VPC it must have its own VPN connection. This was a limitation that drove us crazy. So we asked ourselves, if we are hosting truly stand-alone websites, why do we need direct connectivity to those servers? So with that question in mind we came up with the idea of creating a management VPC that is connected to or corporate network. Then as we create new applications we could add application specific VPCs that where connected to that management VPC. This not only provides a single VPN connection to our corporate network but also isolates each application in its own VPC giving us segmentation at a network and billing level. Build out the management VPC with a /24. (This will be where we build our management servers such as Bastion hosts, patch server, LDAP, etc.) This VPC does not need to have internet access.